A simple, elegant, tailored design with no horizontal seams or stitching. This tailored style is an excellent choice for fabrics with large scale patterns that look best without interruption. When fully extended the entire pattern is displayed. Small tack stitches used to attach the cord rings are visible on the face of the shade. When first installed this style should be pulled up fully and left in place several days to create "pleat memory". 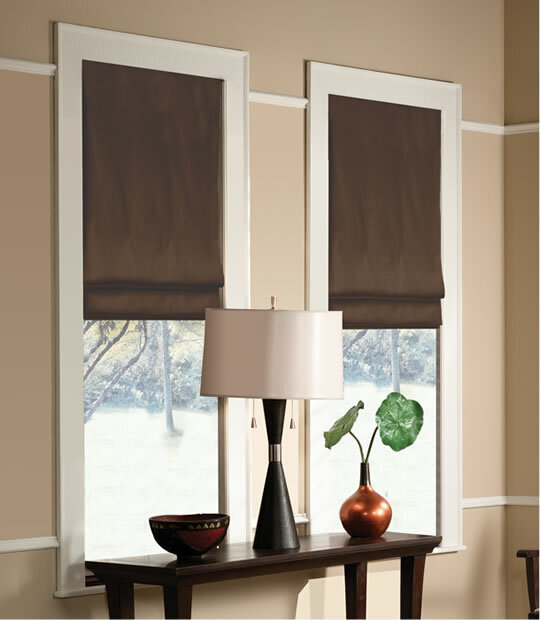 Flat Fold Shades sport a superior headrail and control systems providing easy installation and use. Valances can be added at no charge. These hand-crafted roman shades are elegant window coverings that offer both light diffusion and enhanced privacy for your home. All our shades come with a standard liner. Pleat size is 5" formed as shade is raised. Top pleat size varies 41/2" to 14-1/2"
Flush mounting space required for inside mount 2"
Minimum mounting space required for inside mount is 1 1/4"